Charlotte Gore has posted an excellent article about lending, and the crucial difference between "good" debt and "bad" debt. The point of this post is to attempt to tackle this idea that it doesn’t matter whether it’s the public sector borrowing money and spending it, or the private sector borrowing it and spending it—it’s all just cash and it all goes around just the same, creating demand for food and clothing etc. But there IS a difference, and that difference is everything. It is the difference between real growth—increasing wealth—and simply trading other people’s ability to create wealth in the future for short term political gain. So how is wealth created? Wealth isn’t merely cash. You don’t simply print bank notes and announce yourself to be wealthy. Wealth, real wealth is measured by value. We all know that when a bank lends money, it conjures most of the cash out of the thin air, which sounds alarming… but it is hopefully repaid in full with interest in due course. The loan is supposed to be spent on things of value that generate—or save—more than the amount of the loan plus the interest. In this way, wealth is created. Simple, right? A loan represents future wealth, future value. You borrow money to buy a car, you’re left with a unit of value—the car itself. So, say a bank conjures money out of thin air for me, I spend it on a machine that allows me to make bottle caps, I then sell the bottle caps which eventually pays off the loan and then the rest, for me, is profit. Wealth has been created—represented by the existence of the machine and the bottle caps it produces. The very point of a currency backed by gold—or so goes the theory—is that there is a very limited amount of gold in the world and, therefore, it is extremely difficult to create much more money. The government, for instance, would not have been able to print £200 billion of "quantitative easing" if the currency were backed by gold because there would be no gold to back that £200 billion. The point being, of course, that if the government cannot print more money, then you can reduce inflation significantly. Roughly speaking, the British economy is a little like a publicly listed company on the stock exchange. But whereas those companies have shares, we have pounds. Each pound in your pocket is a share of the wealth of Britain plc. The wealth of Britain plc. is estimated by its GDP, its assets, its future earning power, its level of debt, the confidence that people have in its current and future potential, and hundreds of other factors. As such, the value of the pound in your pocket is affected (to a tiny degree) by the total worth of the economy of Britain plc. More importantly, if the managers of Britain plc. decide to issue more pounds, then the value of your pound will be less because your share of Britain plc. has been diluted. Just of the purposes of illustration, imagine that the value of Britain plc is £100, and there are 100 shares—of which you have one. Your share is 1% of the company, and is worth £1. If, however, Britain's management decide to issue 100 more shares, then you will no longer hold 1% of the company—you will only hold 0.5%. Assuming that no more money has been raised, your share is no longer worth £1, it is worth 50p. However, the reason that most companies issue more shares is in order to raise more money (for expansion, or whatever); thus, the chances are that your share is still worth at least £1, even though you do not own as much of Britain plc. in percentage terms. Having issued 100 more shares, if Britain plc. managed to persuade the investors that the company was worth £200—or would be worth £200 in the very near future—then your share will still be worth £1. However, if the investors decide that Britain plc. is worth £100 or less, then they will pay considerably less than £1 per share; now, not only do you own 0.5% less of the company, your share is also worth less than £1. Which is quite obviously not nice for you—not least because you will need to have more than one share to buy £1 worth of goods. In other words, twice the number of shares have been issued, without Britain plc. being worth twice as much; your share is now worth less than it was before. This is, roughly speaking, what inflation is. At the beginning of the year, Britain plc. issued 200 billion new shares, whilst the value was decreasing. Your share is now worth a lot less than it was before. And with your share being a pound, the pound is now worth a lot less than before. This inflation process particularly destructive to savings, ensuring that the pound that you put away twenty years ago is now worth a lot less than a pound. 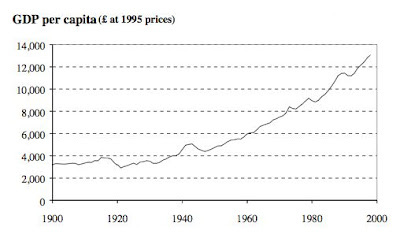 Indeed, the total inflation rate since 1900 is 9348% (calculated here)! £1 now has less than one tenth of the spending power that it had just after decimalisation, in 1971. Now, as we all know, the government is not the only agency that increases the money supply: the banks also do it, through a system known as fractional reserve banking. Broadly speaking, if I put £100 into the bank, the bank can lend out roughly £90 of that. The full £100 is still theoretically in my account, and can be spent by me; but £90 has now been lent out to someone else, and can be spent by them. So, an extra 90 pounds has been put into the economy. And this, of course, should cause inflation. And often does. What the bank is doing—or should be doing—is advancing money that will, eventually, be backed by wealth (or worth). In other words, if the bank lends it to Charlotte's bottle top factory, the money gets repaid but, more importantly, that extra £90 is now backed by at least £90 of created worth. The trouble was, as Charlotte so elegantly articulates, that the banks had forgotten that all of the money swilling about needed to be so backed. It works because the people in the banks try to make good lending decisions. They want to be sure that the money they lend creates value, creates real wealth, because this is how they’re certain they’ll make their money back. They lend money to make it, and people borrow money to make it. Typically loans are ’secured’ against some real existing wealth—property of some kind—so that if the loan is not repaid there is still real wealth to show for the cash. Now, in the credit crunch, when the banks were (and in some cases still are) refusing to lend, you can see how this causes a major problem for any economy that depends on it—and why it caused such a catastrophic contraction in our economy. The reasons for their non-lending boil down to demands from the Government to increase the amount of cash they hold in their reserves and uncertainty that the wealth against which loans are secured have any real value at all. Housing that no-one will buy, for example, is very poor security indeed. The credit crunch itself was caused by banks neglecting this most basic duty of theirs: Lending only when they are certain to get the money back, to take only good, well calculated risks. It turned out that too many loans were secured against very bad risks that other people had taken, resulting in everyone realising there was no security in the system at all whatsoever—and it nearly brought down our entire economy. Indeed. Putting aside the banks' stupidity in this regard, the real and continuing problem is the unwillingness (or inability) to lend. Let's say that I need our putative £90 in order to buy new bottle-top making machinery; obviously, I could save some of the profits from the company but it is going to take ten years to save enough. But without being able to buy this new machinery now(ish), my competitors' cheaper but more exciting bottle-tops will put me out of business. As such, I need a big capital sum now, and I can then afford to repay it through my profits over the course of ten years. Of course, I'll end up paying more (because there will be interest on the loan) but I will still be in business; and if I run the business well, and squeeze the most out of my bottle-top-making machine, I will even be able to increase my profits and therefore be better off than before. And, of course, I have increased the value of Britain plc., hopefully ensuring that the extra money that has been created is backed by real wealth. Of course, lending puts more money into the economy now, and it is usually not backed by worth now. As such, there always tends to be a low level of inflation (at the very least). When inflation gets higher, the usual method to try to reduce it is to raise interest rates. Why? Because if you raise interest rates, you should reduce borrowing—for some people, that extra percentage on inflation will ensure that it is not viable for them to borrow the money and they will find another way around the problem (hopefully). Or, of course, they will put off buying that 42" plasma TV because the World Cup actually doesn't look too shabby on the 30" flat panel anyway. In a gold-backed currency, the gold represents the worth of the currency. So, if you want to print more money or lend some out, then it needs to be backed with actual, physical gold. Over a century ago, most of the developed economies operated in this way, and used the international Gold Standard as a calibration. The upside of a gold-backed currency is that inflation becomes almost non-existent. 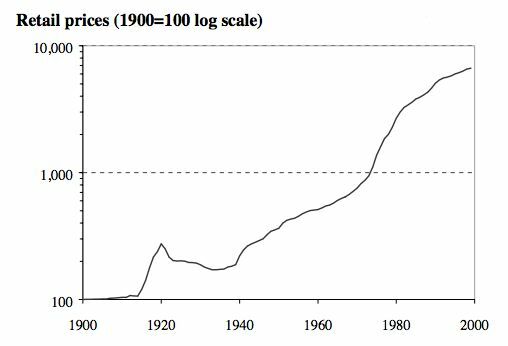 Taken from this government PDF, the chart below shows retail price inflation since 1900: Britain left the Gold Standard in 1914 (to fund the vast monetary expansion required to fight the First World War). The downside is that you cannot lend in the same way—as such, economic growth is, necessarily, a lot slower. From the same PDF as above, this chart shows economic growth over the same time period. Now, one hopes that the growth in wealth will always outstrip inflation and that, as a result, everyone is considerably richer at the end of the exercise. As a general rule, this has been the case over the last century or so. This process of getting richer, of course, is also helped by the rise in productivity which is driven by competition. 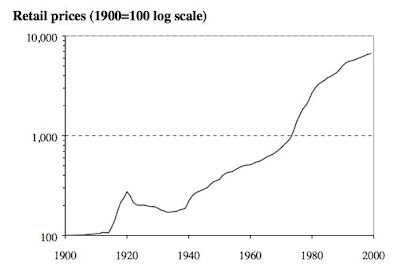 It is self-evident that TVs are far, far cheaper than they were even half a century ago, and computers and other labour-saving devices have also become cheaper and cheaper. So, you have to make a choice...? Do you prefer near zero inflation, or a far faster enrichment of the general population. Broadly speaking, I prefer the latter because, ultimately, it delivers the most utility. In other words, more people getting richer more quickly is better than zero inflation. On the other hand, saving for old age is rather harder, since you have to contend with inflation. Which is why the Libertarian Party policy allows for multiple currencies—one backed by gold, one by the government and then others by the banks themselves. In this way, you enable the lending that drives growth, but also allow a store of currency that maintains its value. 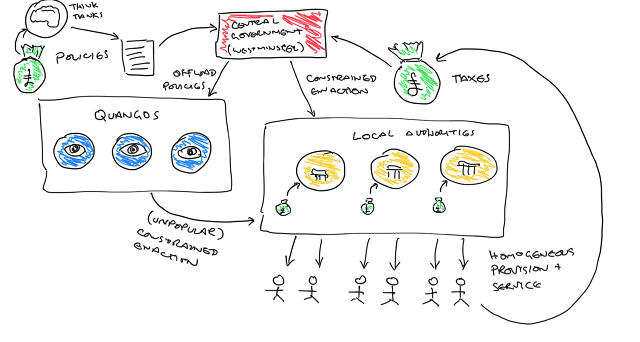 Importantly, you also put currencies in competition with one another, allowing for fluctuations within and between those currencies, whilst maintaining a base currency that holds its value over time. Perhaps we really could have it all...? "Which is why the Libertarian Party policy allows for multiple currencies—one backed by gold, one by the government and then others by the banks themselves. In this way, you enable the lending that drives growth, but also allow a store of currency that maintains its value. Importantly, you also put currencies in competition with one another, allowing for fluctuations within and between those currencies, whilst maintaining a base currency that holds its value over time." Fantastic post. In the absence of exchange controls, isn't what we have exactly as you propose it to be? I can switch my pounds earned into gold or dollars or baht as I please with minimal interference. What are you arguing against? "In the absence of exchange controls, isn't what we have exactly as you propose it to be? I can switch my pounds earned into gold or dollars or baht as I please with minimal interference. What are you arguing against?" You are quite right: you can indeed do this. The difference is at the local level, of course, because one cannot control—in any way—the government actions of foreign countries. And these government actions, alas, severely affect the economy. Well yes, which is why you might have chosen not to switch into Kip or Dong at the wrong moment. Aren't you simply arguing for a specialised international investment market? Or are you asking our government to guarantee the value of our currency? The only problem I have with fractional reserve banking is that I'm not a bank. Most supermarkets already have an alternative currency they're called loyalty cards. It works as company scrip. Take two currencies £ and $. The exchange rate yesterday was £1:$1.5 the exchange rate today is £1:$1.4. If I took £1 yesterday and turned it into $1.50 today I could turn that $1.50 into £1.07. Where did the £0.07 come from in terms of wealth? Another option for funding expensive printing equipment would be vendor financing, which again doesn't require fractional reserves. @Roger - So imagine I start with £1 in the £ bank and transfer it to the $ bank. I now have $1.15. The next day I transfer it back to the £ bank, my total shows £1.07. Which bank provided the 7p? GmT - Gresham's law in full: Bad money drives out good - if it is at the same price. I agree that Fiat and non fiat money would not be good bedfellows, but they would not be at the same price. The gold back money would have amuch higher price than the FIAT money. The demand for it, as trustworthy money would outstrip supply. I agree that the finite supply of Gold would have a constant deflationary effect, but that would not necessarily be a bad thing. "Do you prefer near zero inflation, or a far faster enrichment of the general population. Broadly speaking, I prefer the latter because, ultimately, it delivers the most utility. In other words, more people getting richer more quickly is better than zero inflation." This is simply not supported by the data. The central bank move, which came only 9 days after the latest interest rate increase, means major banks will have to set aside 19.5 percent of their reserves while small and medium-sized banks will have to keep 16 percent of their deposits in reserves.